December 14, 2011 - A tribute to 1Q84 - 1Q84 is a novel by Japanese author Haruki Murakami, recently published in the US in translation in Oct 2011. It is considered by many as one of the best books of 2011. I spent the month of Nov'11 in the strange world of 1Q84 and its 900+ pages. 1Q84, a modern take of Orwell's 1984 is a love story between 2 childhood friends, Tengo and Aomame who can meet again only in the parallel universe of 1Q84. The world in 1Q84 has two moons, 'Little People' often about 6 of them who appear at night to make a 'Air Chrysalis' - a web/virtual womb from which a shadowy self can emerge which can give strange powers to their 'leader'.. for more, you'll have read the 900+ pages !! 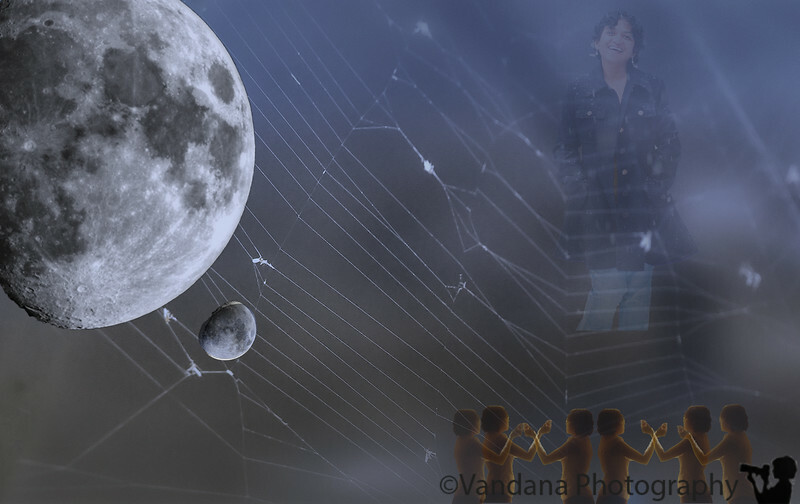 but the 2 moons, air chrysalis and little people are what are represented here .. this image is a composite of 5 different photographs of mine. Seems like an interesting read! Imaginative creation! Great series! I like it!